Combine the two oils. I like to put them in roller bottles. For topical use only. Available for purchase pre-made in roller bottles. $15.00 each. 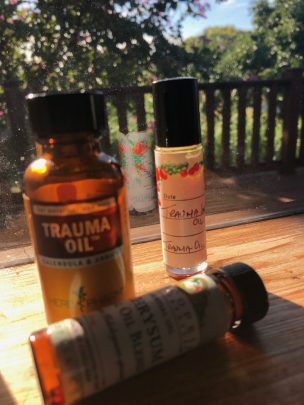 Trauma oil combines calendula, arnica, and st. johns wort in a base of olive oil. I add helichrysum essential oil to this to aid in micro-circulation and healing after an acute injury. How to apply: Place a warm compress on injured area for a couple minutes. Massage in a little of the oil blend 2-3x per day until bruising or swelling dissipates. Do NOT use on broken or abraded skin. Discontinue use if irritation appears. Do not use during pregnancy or nursing.